The JOROTO Magnetic Indoor Rowing Machine comes in two color variant of black and white with model numbers MR30S and MR30 respectively. The two rowers are one and the same with the same features and functionality except for the color difference. However, the black JOROTO Magnetic Indoor Rowing Machine is slightly pricier than the white one. This is a mid-range rower that has some interesting features including a recovery function that measures the heart rate at the end of your workout in order to show a recovery status that could be F1 (best)- F6 (worst). This allows you to have an idea of your fitness level. It has a blue LED backlit monitor that tracks and displays time, time/500m, distance in miles, stroke per minute (SPM), total strokes, calories burned, and heart rate. That said, a heart rate chest strap is going to be required in order to utilize this function and therefore you have to purchase one separately because it is not included in the package. The JOROTO Magnetic Indoor Rowing Machine is not compact but has a space-saving design that allows you to fold it up for storage whenever it is not in use. It features a manual magnetic resistance system that offers decent full body workouts that engage multiple muscle groups and ultimately burn fat and improve overall physical fitness. It has an ergonomic design that makes it a user-friendly rower that is accessible, functional and efficient. Its operation is quiet and smooth which make it suitable for home use because family and the neighbors won’t be disturbed by your rowing activity. There are also several preset workout programs available. Click right here to have a peek at the discounted price of the JOROTO Magnetic Indoor Rowing Machine on Amazon. 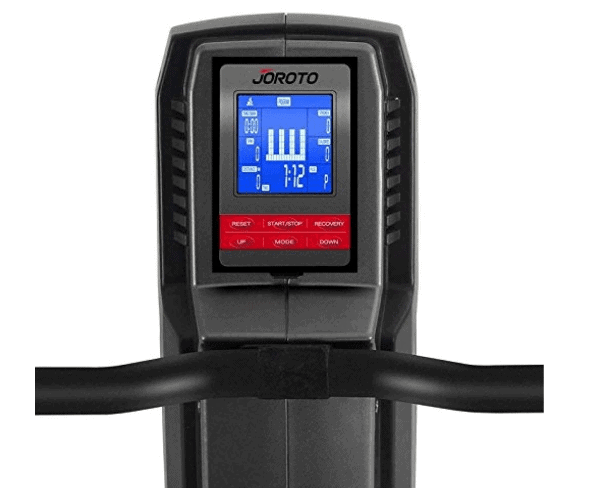 The JOROTO Magnetic Indoor Rowing Machine is simply sturdy and stable. Its frame is made of steel and aluminum which supports 265 pounds/120 kg maximum user weight capacity. Other parts such as the rear base cover and the flywheel covers are made of durable ABS material. Bear in mind that these ABS plastic covers do not have any part in the overall sturdiness of the machine but instead their purpose is to protect these parts and generally beautify the looks of the rower. To further ensure that the steel parts of the rower are protected from rusts and scratches they are sprayed with anti-corrosive paint while the aluminum as you may already know has a natural body that is resistant to rusts. Magnetic rower’s stability is established via the integrated front and rear steel stabilizers. The front stabilizer is equipped with transport wheels that are designed to make it portable. It weighs about 68 pounds/31 kg which also boosts its overall stability. As aforementioned, this is not compact when fully assembled for use because it has overall dimensions of 70.5 inches long by 21 inches wide by 31 inches tall and therefore will take a little bit of space. Differently put, the rower will require a workout area of 5’9’’ long by 1’8’’ wide and average ceiling height. Consider adding extra clearance of at least 1 foot on each side and the rear of the unit for safety and convenience workout experience. The good news is that taller users (6’2’’-6’3’’) can be accommodated and be able to exercise with full leg extension. By the way, if you think that this rower is large you should look up other rowers such as the Concept2 Model E or the Schwinn Crewmaster and you will realize that it is pretty compact after all. The ergonomic design of the JOROTO Magnetic Indoor Rowing Machine is reflected on the seat. It is padded, upholstered and contoured to provide maximum comfort that allows a user to work out longer without getting hurt or bored. The seat is attached to a rail frame that is equipped with 2 heavy-duty ball bearings on each side for smooth unhindered back and forth gliding. These ball bearings are not only heavy duty but protected and covered by the seat frame so that they may be dirt-free. The handle featured on this rower is a straight steel bar that is coated with soft rubber foam that is intended to provide secure and comfortable grips. This means that you won’t experience slippage or blisters in the palms no matter how hard or how long you row. It is attached to a durable nylon rope that is about 1 inch which is also connected to the flywheel for a smooth operation. 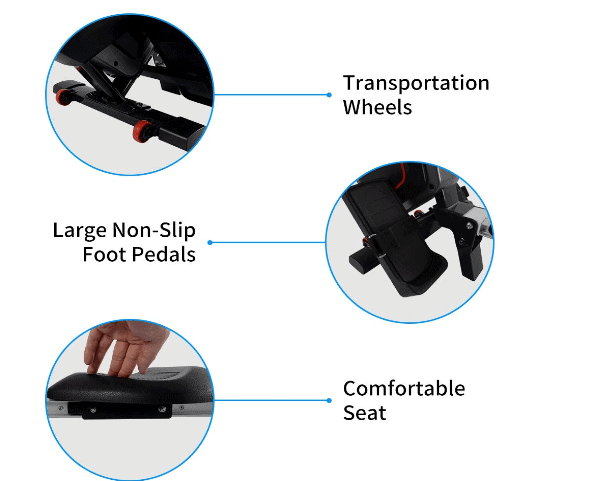 The JOROTO Magnetic Indoor Rowing Machine features large anti-slip footrests that have adjustable safety straps that ensure feet are secure and in place no matter how intense a workout gets. These footrests also have borders around them as an additional feature for securing the feet for comfortable rowing experience. They are not rotary as the ones on the Merax Adjustable Magnetic Resistance Rower but are fixed to a position of about 45 degrees which is considered to be the appropriate angle for comfortable feet placement. 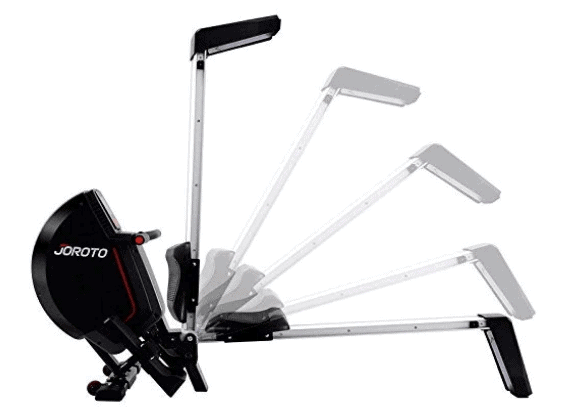 The JOROTO Indoor Rower is equipped with a manual magnetic resistance system that provides 8 levels of resistance that are suitable for beginners and intermediary users. It consists of elements such as a small magnetic brake that is connected to a tension knob which controls its position on the 11 pounds flywheel for resistance adjustment. In other words, when the tension knob is turned clockwise the magnetic brake gets close (the proximity of its closeness is determined by the level it is adjusted to) to the flywheel to generate resistance and when it is turned anticlockwise it shifts away from the flywheel thereby reducing the resistance strength. This means it is a friction-free resistance system that does not cause any part to wear out after a period time of usage and no lubrication is needed either. Therefore, it will suffice to say that the resistance system is totally maintenance free. The resistance strength is static to the appropriated level it is adjusted to when working out and doesn’t change by the tempo of your workout activity as the case with a rower that has dynamic water or air resistance system. However, the magnetic resistance system is very quiet during operation and therefore you can train at any time of the day and even be able to watch your favorite TV show or listen to good music. As aforementioned, the resistance system provides a decent challenge that could help beginners and intermediary users to lose weight, and get their grooves back and also anyone else that simply wishes to perform full-body cardio workouts that could help them improve and maintain their overall physical fitness. The console integrated on the JOROTO Magnetic Indoor Rowing Machine is mid-range and has some features that make it above basic. First of all, it features a blue LED backlit monitor that tracks time, time/500m, distance, strokes per minute, total strokes, calories burned and heart rate. It can read your pulse through the use of an HR chest strap which is not included in the package; you have to purchase that separately if you wish to keep an eye on the pulse rate data so as to maintain your target heart rate zone. Obviously, the monitor’s readability is excellent and won’t be compromised by an environment that has poor visibility. Moreover, you don’t need a SCAN function because the monitor could display all the workout data all at once. There are 16 preset workout programs that include 1-5 programs for light, smooth and quick cardio workouts, 6-11 programs for increasing the level of fitness and training, and the 12-16 programs for high calorie burning training. Finally, it has a very important feature called the recovery function which measures the heart rate at the end of your workout to provide a recovery status between F1 (best)- F6 (worse). The idea is to give you an inkling of your fitness level. No accessory is present on the JOROTO Magnetic Indoor Rowing Machine. You must improvise to keep water handy during a workout session in order to stay hydrated. It is easy to store the JOROTO Magnetic Indoor Rowing Machine because of its space-saving design and the integrated transport wheels. It could be folded up, locked and be rolled away to the storage location without hassle. It folds up to an upright position that reduces the length dimension to less than half its size. At the time of this review there the Amazon customers’ reviews of the JOROTO Magnetic Indoor Rowing Machine are positive and the average approval rating is good. This indicates that the unit is cost-effective. The JOROTO Magnetic Indoor Rowing Machine is shipped in a box that weighs about 98 pounds and just like every online order the shipping cost is determined by the shipping policy of the vendor you are purchasing from. However, Amazon is one of those vendors that provide free shipping and delivery is made within days from the day order was placed. The JOROTO Rower comes preassembled with the main components already attached. There are only parts such as the rail, the front, and the rear stabilizers, and the seat that need to be attached to the core unit. These are not going to take much time to fix and therefore should take less than an hour to completely assemble. Moreover, an instruction manual that guides you through the process of assembly and the tools required for the job are included in the package. Basically, this rower is maintenance free as there is no major maintenance that needs to be done. You have to always examine the unit before use for any loose or broken part in order to prevent a possible accident or further damage to the rower. Finally, ensure to keep it clean from dirt and sweat before and after use. 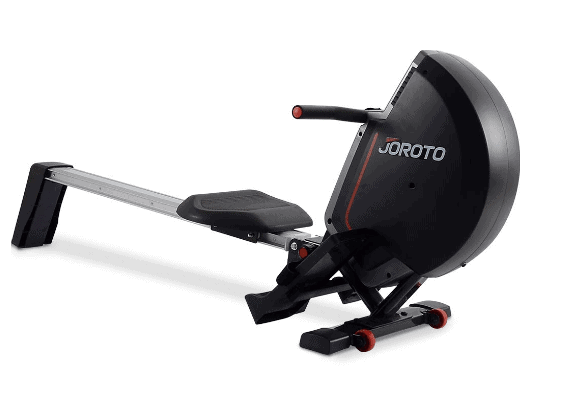 The JOROTO Magnetic Indoor Rowing Machine is a mid-range rower that features extra functions that are comparable to the ones on some high-end rowers. Such functions are the 16 preset workout programs, the recovery function, and the blue LED backlit monitor that also tracks the heart rate.